The marathon Treason Trial of 1956–1961 followed, with all defendants receiving acquittals. From 1952–1959, a new class of black activists known as the Africanists disrupted ANC activities in the townships, demanding more drastic steps against the National Party regime. The ANC leadership under Albert Luthuli, Oliver Tambo and Walter Sisulu felt not only that the Africanists were moving too fast but also that they challenged their leadership. The ANC leadership consequently bolstered their position through alliances with small White, Coloured, and Indian political parties in an attempt to give the appearance of wider appeal than the Africanists. The Africanists ridiculed the 1955 Freedom Charter Kliptown Conference for the concession of the 100,000-strong ANC to just a single vote in a Congressional alliance. Four secretaries-general of the five participating parties secretly belonged to the reconstituted South African Communist Party (SACP), strongly adhering to the Moscow line. In 1959, the ANC lost its most militant support when most of the Africanists, with financial support from Ghana and significant political support from the Transvaal-based Basotho, broke away to form the Pan Africanist Congress (PAC) under the direction of Robert Sobukwe and Potlako Leballo. In response to the adoption of the Freedom Charter at the Congress of the People, the Apartheid government in South Africa arrested a total 156 people. This was almost the entire executive of the African National Congress (ANC), Congress of Democrats, South African Indian Congress, Coloured People's Congress, and the South African Congress of Trade Unions (collectively known as the Congress Alliance). They were charged with "high treason and a countrywide conspiracy to use violence to overthrow the present government and replace it with a communist state." The punishment for high treason was death. Who Was Arrested in the Treason Trial? On 5 December 1956 the police arrested 144 people in raids across South Africa, including Chief Albert Luthuli (president of the ANC) and Nelson Mandela. The following week, another 12 people, including Walter Sisulu, were arrested. In total the police arrested 156 people: 105 Blacks, 21 Indians, 23 Whites and 7 Coloureds. How Did the Treason Trial Proceed? The accused were represented by a legal team which included Izrael Maisels, Sydney Kentridge, Vernon Berrangé and Bram Fisher. A Treason Trial Defense Fund was started up by Bishop Ambrose Reeves, writer Alan Paton, and Alex Hepple to pay the bail of the accused. The trial required two stages, a preparatory examination in a magistrates court which would determine if there was sufficient evidence to support a trial, and then, if evidence existed, a trial by the Supreme Court. The preparatory examination of the case lasted until January 1958 (over a year), and resulted in charges against 61 of the accused being dropped - 95 people were still facing trial. The treason trial proper started on 3 August of 1958. What Evidence Was Presented at the Treason Trial? The Crown (government) proffered over 12,000 items of documentation, collected over a three-year period (it took almost a month for the submissions alone). Of the more curious documents the Crown presented were two signs taken from the Congress of the People: "SOUP WITH MEAT" and "SOUP WITHOUT MEAT". 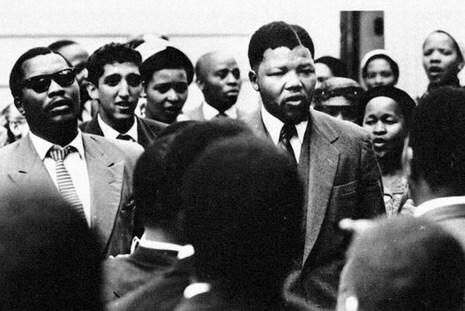 Evidence presented by the Crown during the trial included several first-hand accounts by both Black and Afrikaner 'detectives' of speeches given at ANC meetings. Under cross-examination it was revealed that many of them could not understand English, the language in which the original speeches were made, and had in fact been provided with notes on the speeches by the Crown. The main piece of evidence against the accused was a recording of a speech made by Robert Resha, the Trasvaal Volunteer-in-Chief: "When you are disciplined and you are told by the organization not to be violent, you must not be violent ... but if you are a true volunteer and you are called upon to be violent, you must be absolutely violent, you must murder!" During the defense it was shown that Resha's viewpoints were the exception rather than the rule in the ANC, and that the short quote had been taken completely out of context. What Was the Outcome of the Treason Trial? Within a week of the trail starting, one of the two charges under the Suppression of Communism Act was dropped. Two months later the Crown announced that the whole indictment was being dropped, only to issue an new indictment against 30 people - all members of the ANC. Additional indictments against another 61 people were threatened but were never realized. Chief Albert Luthuli and Oliver Tambo were released for lack of evidence. Nelson Mandela and Walter Sisulu (ANC secretary-general) were among the final 30 accused. On 29 March 1961 Justice FL Rumpff interrupted the defense summation with a verdict. He announced that although the ANC was working to replace the government and had used illegal means of protest during the Defiance Campaign, the Crown had failed to show that the ANC was using violence to overthrow the government, and were therefore not-guilty of treason. The Crown had failed to establish any revolutionary intent behind the defendant's actions. Having been found non-guilty, the remaining 30 accused were discharged. What Were the Ramifications of the Treason Trial? The Treason Trial was a serious blow to the ANC and the other members of the Congress Alliance. Their executive members were out of circulation for a considerable period (even those discharged early on had to face further harassment and banning orders). Additionally, there were considerable costs involved. The funds and organization of the various groups suffered. Most significantly, the more radical members of the ANC's Youth League rebelled against the ANC interaction with other races, and left to form the PAC. 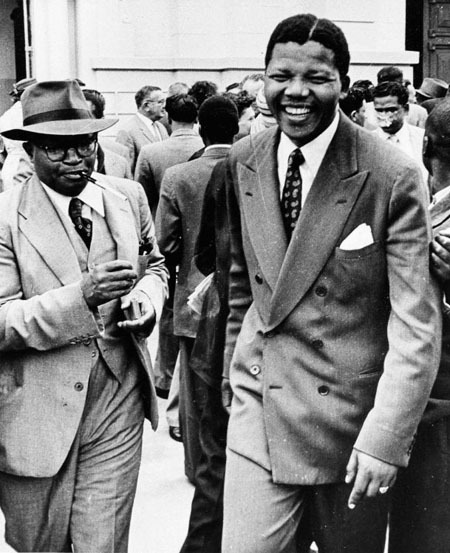 Nelson Mandela, Walter Sisulu and six others were eventually given a life sentence for treason in 1964 at what is known as the Rivonia Trial. What Other Significant Events Took Place During This Time? 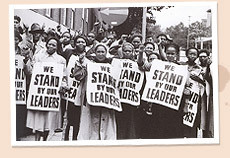 During the period of the Treason Trial the National Party won another election, ANC and PAC were declared illegal (under the Suppression of Communism Act), the South African government held a referendum (Whites only, of course) on the question of whether South Africa should become a republic, and the PAC initiated anti-pass demonstrations, one of which ended up as the Sharpeville Massacre. PROSECUTION: Do you think that your People's Democracy could be achieved by a process of gradual reforms? Suppose, as a result of pressure, the ruling class were to agree next month to a qualified franchise for the Africans, an educational test perhaps-not a stringent one-and next year, as a result of further pressure, a more important concession is made-a further concession is made in 1962, and so on over a period of ten or twenty years-do you think that the People's Democracy could be achieved in that fashion?